The 2020 Olympics are coming up in just over 3 years. Following the strong performance of the Australian men’s basketball team, the Boomers, in 2016, many fans have very high expectations coming into the Tokyo games. Below I will outline everything that you need to know about the Australian Boomers’ lead up, including information about players and staff, upcoming competitions, and possible matchups. 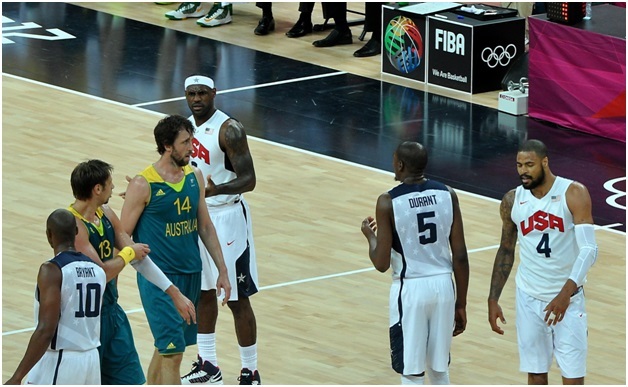 In the 2016 Olympic Games the Boomers shocked the basketball world. They came from nowhere to defeat Serbia and France in the pool matches, losing only to eventual gold medalists and long time world champions the USA. With a team boasting four NBA championship players, the Boomer’s almost caused a massive upset in the bronze medal match against Spain to claim their first Olympic Games basketball medal. But alas, it wasn’t to be with the sharp shooting Spanish just coming out on top where it counts: on the scoreboard. This was the Aussie men’s fourth fourth place finish in Olympic Games competitions, and arguably one of their best. Although the team was obviously disappointed not to have gone further, the future is extremely bright. The Boomer’s squad for the 2020 games looks to be many times stronger than the 2016 squad – on paper at least – something which will leave them filled with confidence and hoping to secure that elusive medal. While we are still three years away from Tokyo 2020, it is already possible to pick a probable team for the tournament. The Australian team which competed in Rio featured mainly young players, which means that most of the team will be available for 2020 selection. Just three 2016 players are expected to be out of the team due to age: Kevin Lisch (34 years old in 2020), Damian Martin (35), and David Anderson (40). Ben Simmons, former NBA number 1 draft pick and current Philadelphia 76er. He should be a walk up starter come 2020, and at just 21 years old the future is extremely bright. Dante Exum, current NBA player with Utah. Although Exum recently had a major setback in the form of a torn ACL, he is touted as a future leader of the Boomers, and should also be a walk up starter in 2020. Thon Maker, a number 10 NBA draft pick and rising young player. At just 20 years old Maker hasn’t yet reached his full potential. As long as he keeps developing like he is then he will be a valuable Australian player for years to come. Patty Mills – coming off a wonderful 2016 campaign where he was one of tournaments leading scorers, Mills is expected to play a huge role in 2020. Aron Baynes – Baynes will be 33 years old in 2020, but the big man is still expected to play a huge role in Australia’s medal hopes. While this is purely a speculative team of maybe’s, it is absolutely chocked full of NBA talent, and would be expected to propel Australia towards its first games medal. We can only hope! Many of the Boomer’s likely 2020 players are currently paying in the NBA, and those who aren’t are either in the NBL or playing professionally in Europe. While this will ensure that the team is match-hardened and well versed, nothing helps you practice for a major tournament like playing in a major tournament. With this in mind the 2019 FIBA Basketball World Cup shapes as a pivotal part of the Boomer’s lead up to Tokyo 2020. It is held in China, and should give them some much needed match practice as a team. It could be the first and only time that the Boomer’s best team plays together before the Olympics, and should give us a good idea of where they are at. After much speculation it was recently confirmed that the Boomer’s 2016 head coach, Andrej Lemanis, would go around again, fulfilling the same role in the lead up to the 2020 games. Lemanis is the current coach of the Brisbane Broncos, and boasts an impressive record – including winning the NBL coach of the year award twice and the NBL championship three times. The Basketball Australia head office was reportedly extremely happy with the way Lemanis coach the 2016 squad, and apparently didn’t hesitate to reappoint him. I’m sure that many fans will be pleased with this decision, especially considering the wonderful performance of both Lemanis and the Boomers at the 2016 games. The future of Australian men’s basketball is extremely bright. As supporters we have a lot to look forward to, including, hopefully, the Boomer’s first 2020 medal. To Tokyo and beyond!